Charlie Heaton and Millie Bobby Brown wear white high top Converse “Chuck Taylor” All Stars in the series. Eleven awakens in the Upside Down after defeating the Demogorgon. Last summer, the Netflix Original series Stranger Things took the binging public by storm. Bolstered by great acting, a sci-fi mystery, and 80’s nostalgia, the show became a phenomenon. Season 2 was announced shortly after the release of season one, with a release date of Halloween weekend of 2017. The second season expands the incredible ensemble cast of the first, and stars Winona Ryder, David Harbour, Finn Wolfhard, Millie Bobby Brown, Gaten Matarazzo, Caleb McLaughlin, Natalia Dyer, Charlie Heaton, Noah Schnapp, Sadie Sink, Joe Keery, Dacre Montgomery, Sean Astin, and Paul Reiser. 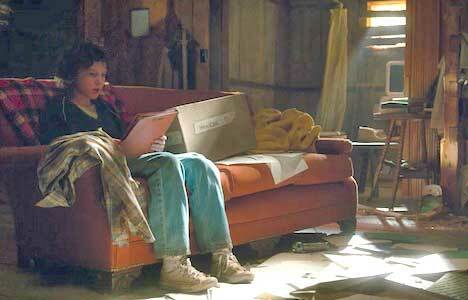 Eleven walks back into the real world. Taking place one year after the events of season one in October, 1984, the show explores the fallout on the town of Hawkins, Indiana after the group’s battle with the Upside Down. Will had been rescued, but few people outside of group that was there know the details of what happened. Everyone is attempting to act like things are back to normal, but Will is still having “episodes” where he connects with the Upside Down. In one of these episodes, he see a giant shadow monster engulfing the town, and this sends him into a panic that the Upside Down is coming to Hawkins. Weird things begin happening around town, with crops dying out from some sort of plague, and at Hawkins Lab still conducting experiments. Chief Hopper is skeptical of the plague, but knows that he must continue to keep a watchful eye. Elsewhere amongst the group, Dustin and Lucas take an interest in the new girl who has moved into town. She goes by Max, and has successfully beaten their high scores in “Dig Dug”. Mike has no interest in her as all he can think about is Eleven, who hasn’t been seen since she sacrificed herself to save the group at the end of season one. He calls her every night on a secret channel on his walkie-talkie, hoping that she’s still out there. Little does he know, that she is, and she can hear him. 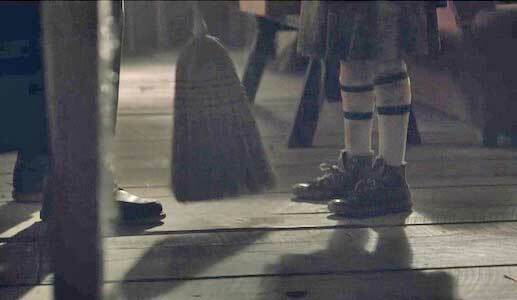 Cleaning up Hopper’s cabin in white chucks. 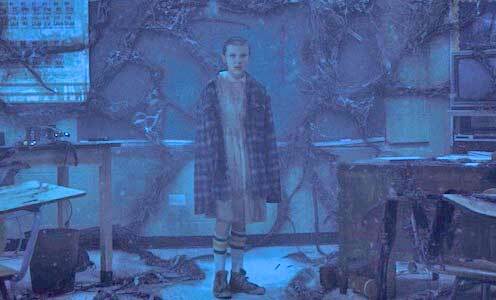 Eleven awoke in the Upside Down after killing the Demogorgon from Season One. She was able to find an open gateway, and escape into the real world. She was on the run for a few months, scavenging in the woods, until she was found by Hopper. He takes her in, and relocates her to his cabin in the woods, where she’ll be safe from the FBI agents that have been canvassing the town trying to find her. This brings us to the present day, where we see that Eleven has changed during her time living with Hopper. She’s speaking in more complex and coherent sentences, and has expanded her vocabulary in leaps and bounds. She’s growing up, growing her hair back out and styling herself like an everyday teenager in chucks. This has led her to have a better understanding of the world around her, which in turn has made her being locked up in the house alone even harder on her. This eventually leads her to running away from Hopper after the two have a fight. She goes on a search for answers as to where she comes from and if there are others out there like her. This new Eleven is longing for the same things everyone looks for when we become teenagers: independence and belonging. Eleven (Millie Bobby Brown) wears white high top chucks throughout this season. This season of Stranger Things is full of action, mystery, and drama, and takes the series into an exciting direction. The growth of these characters over the first two years of the show has been incredible to watch, and is only possible because of the stellar performances of this incredible, young cast. Steve Harrington (Joe Keery) is the real MVP of this season and deserves all the love he’s gotten online since the premiere. The climax battle and final scene will leave you on the edge of your seat waiting for season three. So, if you liked the first season of Stranger Things, you’ll most definitely be satisfied with what happens a year later, and what’s to come in the future for the small town of Hawkins. 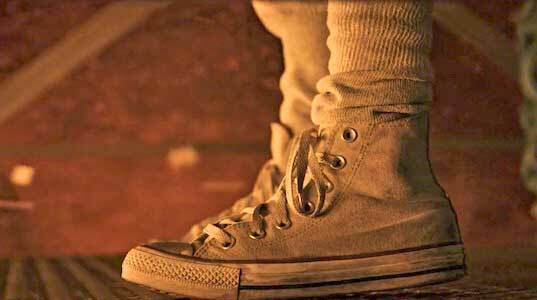 Eleven’s chucks during the climactic battle of the season.